"I have been to see Alison a few times. She is concise and accurate. Her readings are unbelievably insightful and she picks up on events you may have even forgotten about! I have recommended her to many of my friends, who also think she is fantastic. She will not give you false hope, she will tell you as it is and be as truthful as the spirits tell her to be. From my experience, everything she tells you does happen and you think... Alison said that! Or you meet someone and think... Alison told me about him etc! She has a great gift!" Easter Special Offer! 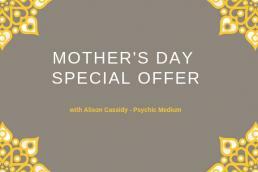 Buy a 20 minute Psychic Phone Reading with Alison Cassidy and get 10 minutes extra FREE! "There were lots of things going on in my life, some good and some not so! My friend could see the turmoil I was in as I had some serious decisions to make re my work and personal life. She suggested having a psychic reading with Alison. I have never had a psychic reading so if I'm honest I was sceptical, but my friend really sang her praises. I'm so glad I gave it a go. Alison was lovely, genuine and gifted. She connected with me quickly and picked up on all that was going on around me, without me having to really say anything. This amazed me! She made sense out of my messy situation and really helped me to look at my situation from a different perspective. 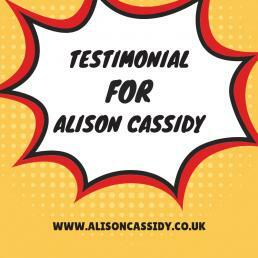 I couldn't recommend Alison enough!" "Alison has read for me on a several occasions and I have always found her to be very friendly and easy to talk with. No questions are asked and she gets straight down to the point and the accuracy of information given has always been spot on and predictions, so far, have come to fruition. 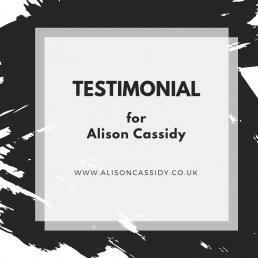 As a business owner myself, Alison has been able to provide readings on business matters when it comes to personnel and company growth and she has proven herself to be very accurate with her intuition and has provided very good suggestions." Mother's Day is fast approaching... Have you brought a gift yet? 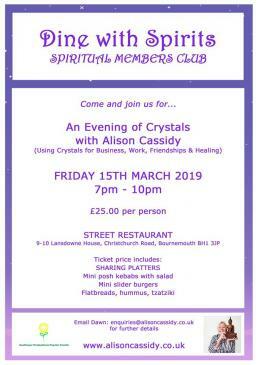 Thank you to our 20 guests who came on Friday night to our ‘Dine With Spirits - Crystal Night!’ Guests enjoyed a tasty sharing platter from Street - Eats & Cocktails, had a Spiritual & Personal question answered by Alison, and had a mini psychic crystal reading. A big thank you to Sandy for surprising Alison with a lemon birthday cake, it was a lovely surprise! "I came to Alison feeling very low due to multiple problems, past and present. 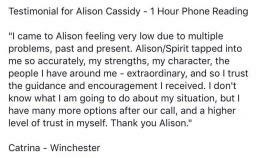 Alison/Spirit tapped into me so accurately, my strengths, my character, the people I have around me - extraordinary, and so I trust the guidance and encouragement I received. I don't know what I am going to do about my situation, but I have many more options after our call, and a higher level of trust in myself. Thank you Alison." 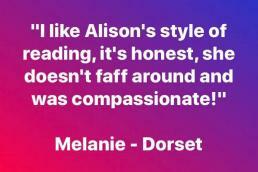 "I like Alison's style of reading, it's honest, she doesn't faff around and was compassionate!" "Alison provides key information regarding business activity and individuals that you may encounter along the pathway to achieving your business goals and targets. Interesting view points on tactical decisions and contract clause awareness with new and existing appointments are also brought to the table which gives great comfort with a view ahead. Client guidance on character is also valuable with analysis on tendencies of certain individuals you may be engaging with and certain things you may want to avoid." 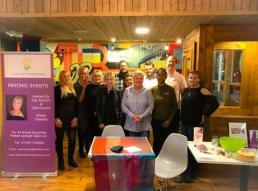 "Just wanted to say a massive thank you for offering the meeting with Alison it was great to meet her. She offered some interesting insights in to what was happening in my business over the next couple of years and how my family would get on in the future. It was a great hour spent chatting together." 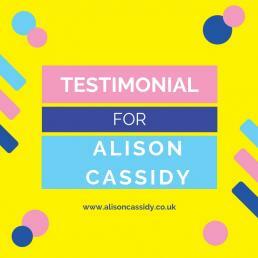 "Firstly I would like to say thank you very much to Alison for my reading! Alison knew a lot of things about my life that I hadn't even mentioned to her which was great as there were certain things I wanted and needed answers for and I got some of these which has brought peace to me. Thank you very much." 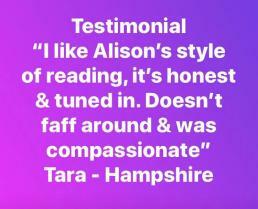 "I like Alison's style of reading, it's honest and tuned in. Doesn't faff around and was compassionate." 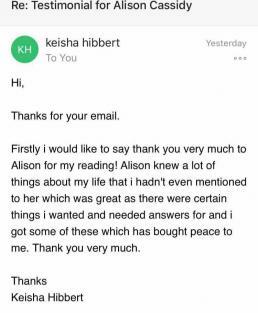 "Hey Dawn, so I had my reading with Alison today, she is incredible and knows what she is talking about! I am converted and very very impressed!" 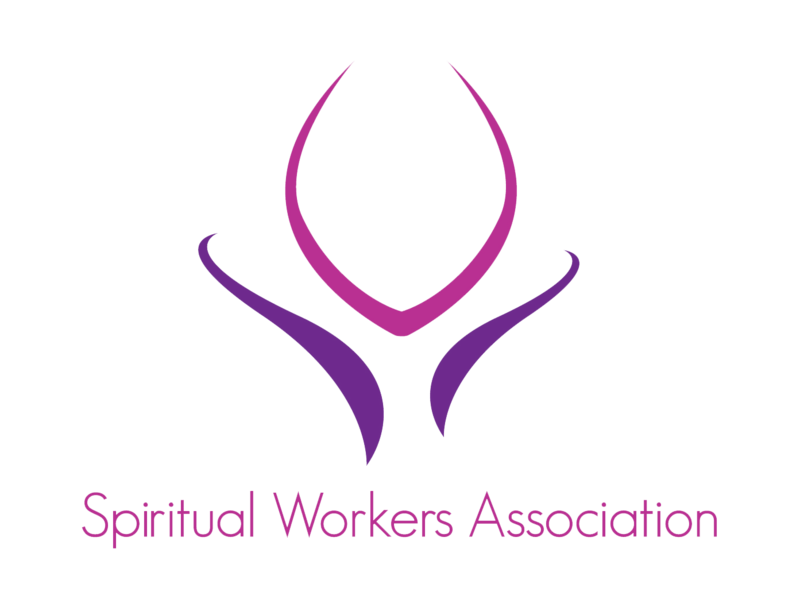 "Alison will give you an insight into how to effectively use crystals for business, work, friendships and healing. How to use them to get over a relationship, or to find and start a new relationship. How crystals are used to cast spells and to make good luck charms. How to cleanse your crystal before you work with it. How to programme your crystal to help you get the most from it. How to make an exilir from using crystals for healing, and crystal meditation. 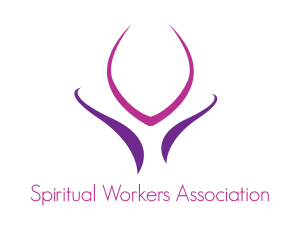 You will also get the chance to ask Alison a spiritually related question and a personal question. Alison will also be giving each guest a mini crystal reading!" I would like to thank you for a great evening of the Runes with Alison tonight. It was amazing how you can tell so much from these stones. I was shocked when Alison read mine as they were absolutely spot on about my nail business career. Alison said that I haven't put in enough time effort and she was right. After so long of trying, I kind of took a step back and now I know I really need to push myself forward. Alison also mentioned, that I have made some changes and yet again she was right. I decided to only do gel nails and not acrylics but, Alison asked me to change it back so I will do that. Watching everyone tonight and hearing their readings and seeing their reactions was just mind blowing. Everyone including myself had such a fun and exciting time with jokes and laughter too. The food at The Street is always delicious and nicely presented. Its got a very nice cosy feeling and the staff there are great. Thank you once again and I can't wait for the next evening with Alison.